I've just made a new candle mold. It's made from a real chicken egg and I'm making a few sizes just for variety. So far I've got this smallish one. 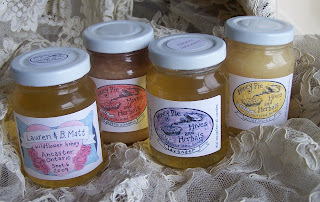 All of our candles are made from pure beeswax. It's so lovely and golden - I'm thinking the goose that laid the golden egg. I need to get my hands on a goose egg. I used to have a pet goose named Google but she alas met with an unfortunate end. 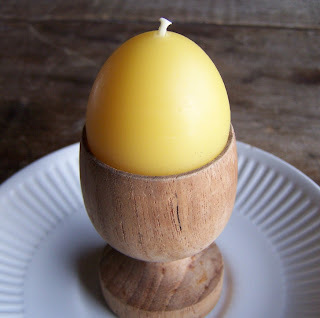 So, for now we have chicken egg candles and they will be perfect for Easter. I'm trying to find the perfect egg cup to sell them in that will work as candle holders. This wooden one is too flammable. I've also ordered half size egg cartons so we can sell them in sixes. I'll post a photo once I have one. This is a recipe from my mom. I have fond memories of munching on these when I was a girl in PEI. I haven't had them in years but I love anything with honey in it so I had to try. Plus, there's a wonderful source of organic popcorn at the Green Barns farmers' market we sell at- Passion Popcorn. A cool website I just discovered called Apron Memories - all kinds of great aprony stuff. I love aprons and collect them. I have so many I want to have an exhibition with them. Turns out someone else had the same idea. Apron Chronicles. Oh well, I might have to do it anyway.